I’m always a believer in using obfuscation to help with security. If you are trying to hide something, why not make it look like something else? That’s why I like the looks of this safe. Is it a safe? Is it a radio? It’s both. I doubt many people, in casual passing, would notice that this is a safe. This safe sports some neat features such as an FM radio, an iPod/iPhone dock, sturdy steel construction and biometric fingerprint access. The fingerprint reader can store up to 120 fingerprints from any number of users. 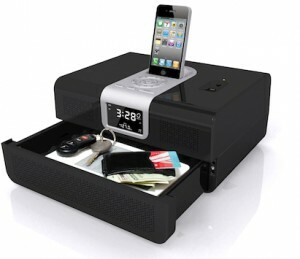 The iPhone/iPad dock will charge your devices. There’s speakers on-board. The radio works without a device docked. Yep, everything works like a typical dock/radio and it is also a safe.